The great Carthaginian general, Hannibal, has never forgotten the defeat and humiliation of his people by Rome. Now he plans his revenge and the destruction of the old enemy. While Hannibal prepares for war, Hanno, the son of one of his most trusted military commanders goes out fishing with Suni, his best friend ― and is washed out to sea. Captured by pirates, transported to an Italian slave market, one of the boys is sold as a gladiator, the other as a field slave. Both believe that they will never see home or family again.Against all probability, Hanno strikes up a relationship with Quintus and Aurelia, his Roman master’s children. But trouble is never far away. As the Second Punic War begins, pulling the world into chaos, Hanno’s life is threatened by a cruel overseer, while his friend battles to survive as a gladiator. The destiny of all four young people ― Roman and Carthaginian ― is to be an extraordinary one. So too is that of their families. 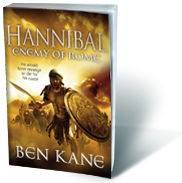 The devastating war unleashed upon Rome by Hannibal will change all of their lives ― and history ― forever. Mr Cane, I would just like to say how much I have enjoyed your book I just finished it today, it was written beautifully I started it yesterday and was unable to put it down till the very end 🙂 Are you making a sequel?? Will Hanno become a high ranking officer like his brothers? How many years ahead will you bring the story does Quintus meet Hanno again and of Quintuses sister what becomes of her? I fully understand if you cant answer these questions, so let me hinder you no longer with my mindless questions I am only fourteen after all ;). Many thanks a Fan. @s.tinez: Thanks for posting, and welcome to my site. It’s great that you enjoyed Hannibal so much. I loved your first trilogy and read with great enthusiasm. I was able to get Spartacus on my Kindle recently, and no doubt loved that as well. But for whatever reason it may be, you or your publisher do not have the kindle format for American Amazon, only European. I hope to read Hannibal, and any of the other squeals to come! Thanks for the reads! @Josh: sorry for the delay in approving this – for some reason it had gone into the spam folder. Glad you liked the first trilogy. What are referring to about Kindle format – it’s not clear. All of my books are available on Kindle in the UK. All bar Hannibal are available in the USA. The reason Hannibal isn’t is that it hasn’t been published in the States yet. Is that what you mean? Sorry if it is – it doesn’t come out until next year. You can order the real book (shipping free of charge) from bookdepository.co.uk – their prices are close to Amazon’s, if you can’t wait! @alicia1985: Thanks for your post, and welcome to my site! I’m really sorry about the Festival of History – it was so disappointing all round. Regarding signings, keep an eye on the events page on the site. I haven’t any booked in your area currently, but that might change. The first of your books that I have had the pleasure of reading, and definitely one of the best historical fiction works I’ve read. I look forward to purchasing ‘Spartacus’ and of course, to reading more of Hanno’s adventures in books (hopefully) to come! @Nordicthunder: thanks for posting, and welcome to my site. High praise indeed for Hannibal – thank you very much. You’ll be pleased to know that there will be 3 more books in the series. I’m busy writing Fields of Blood, the second, at the moment. It’ll come out next summer. I hope you enjoy Spartacus and its sequel, which is out in little over 3 weeks! I had the same problem with my order through Amazon.uk and not only with Ben’s e-books. I think the reason that UK site can’t deliver the file wirelessly is this: they using different wireless delivery via Amazon Whispernet that is sold by Amazon Media EU S.à r.l. It’s the same problem as DVD formats : EU vs.US/North Am. I hope it made sense to you, Josh and Ben. Awesome book! Can’t wait for the other two. Its just so easy to read and how you bring the ancient world to life, its just immense! Still not better than the Spartacus sequel, YET. But thats almost impossible! @Bradzer00 – many thanks for posting, and for your kind words. Good news: I intend to write 3 more Hannibal books now! First Ben Kane book I read. I was waiting to meet a friend in Waterstone’s and started reading while I waited. By the time my friend turned up I was so engrossed he had difficulty getting me out of there. Brilliant stuff when will the next in the Hannibal series be released. I’m guessing soon as I noticed you’ve recently visited the battlefield at Cannae. I’ve also read all of the forgotton legion trilogy and loved it! And have recently purchased the first two Spartacus books which I look forward to reading! @Andyt20: How glad am I that you picked up my book by chance! I’m delighted you enjoyed it so much. Fields of Blood, the second book, comes out June 6th. Enjoy the Spartacus books in the meantime, and Happy New Year to you. I have been searching for the launch date for the second Hannibal book and just noticed it here looking forward to it coming out. I will get it pre ordered from Amazon. I have seen your facebook post about the walk along Hadrians Wall, so small donation for the three of you, I would have tried to get the Rig-Pigs to donate as well but I am off on the Sick due to the small matter of a Heart Attack, expected to make 100% recovery so no worries. and not due back to the Rig until Feb where they have put me in the pool and I am heading for West Africa. I will see who is on-board and try to extort some cash out of them. @plato: Yikes, very sorry to hear that you’ve had a heart attack. Get well soon. Glad that you know about Fields of Blood, and thanks for planning to preorder it! Any donation, however small, will be gratefully received, thank you. And if you can persuade anyone on the rig in West Africa to bung some money at us, even better. Cheers! Hi, Sir Kane. I´m a young man…I´m 18. I live in Spain, where in the past the actions of Hannibal and Cartago, then Roma and his legions ocurred. Since my childhood, I was interested in the classical empires. But the Roman Empire in special. Great wars, like the Punic Wars Classic aroused my curiosity. When I was 15, I studied the subject of classical culture in school. And here one day spoke of the legendary Hannibal and Scipio, roman senator opponent. Since that day I always felt very connected to the figure of the Carthaginian general, so I started reading on the internet about him, his family, Carthage…And his military exploits, especially the passage through the Pyrenees and the Alps to reach the heart of Rome. For this when in a shop of my town, Coruña (northwestern Spain), I saw a great announcement of his book, did not think twice and ran to buy it. Certainly it had already seen other books of Hannibal, as “Hannibal , Pride of Carthage” .But his book is different and I like it. I hope the second installment. Congratulations!! @Alejandro: Muchas gracias por tu mensaje! I am very glad that you liked Anibal. There will be four books altogether – the second one is coming out in English this summer. I hope it comes out in Spain soon too. You have another spanish fan here. I loved your book and i hope you are going to describe Hannibal life until his death. Most of the books about Hannibal finish in Zama`s battle or a few months later. I hope your book continue much more years after this battle. @eruizaz: Buenas, y lo siento for not replying sooner! Great to know that you enjoyed Anibal: Enemigo de Roma. You will be pleased to know that I am going to write at least 3, 4 or even 5 more books in the series. However, I am not sure where I will end it…! I am a huge fan of your books. I have finished reading the Forgotten Legion trilogy, Hannibal, and now I am onto Spartacus. I must say that it seems as though your writing is improving with each book. I will admit that at times it does seem as though each book follows a similar plot, but frankly I don’t think you need to change that. Each character in each book has a way of making not only their individual story, but the story as a whole come alive. One feels as though they are actually in the book watching everything unfold as an innocent bystander. I can’t wait until you finish the two trilogies that you’re currently working on, but I had a suggestion, or idea if you will. I think that it would be quite enjoyable if you incorporated two different series together. As in you have two main characters from different books meet each other. From there you could possibly go into how each one affected each others’ story. I think that you be something that really only great authors can pull off without it looking sloppy, but based off of what I have read, I think it’s something that you could not only do, but easily breath life into. @irishwit77: Hi Cody! Thanks for your post, and your praise. I like to think that my writing is improving too – although I’m not always sure of that! As for having the characters of two book series meet each other, well, I have already thought of that. Maron or Carbo from Spartacus might well meet Romulus from Forgotten Legion one day…! Gee, I love all your books. I wish you would write noe on the civil wars between Marius, Cinna and Sulla. Writing about the kind of hell the average Roman citizen had to go thru on a daily basis at this time. @2fastannie: thanks for your good wishes! As for the civil wars you mention, yes, I’ve thought about them…just not enough time at the moment! @broomeinator: thanks – glad you like them. Not planning on writing about anyone very famous other than Hannibal at the moment. The Black Prince will be within the next couple of years. There’s a lot of history out there! I have read 4 of your books. Hannibal Enemy of Rome is my favourite. I look forward to the release of Fields of Blood. The first Hannibal book stuck to the facts of each of the 2 great battles where Rome was defeated and I commend you for your diligence. By facts I mean what Polybius wrote as a contemporary of Hannibal and Scipio. Robert L O’Connell (Ghosts of Cannae – non fiction) wrote about the Battle of Cannae where he states that the greatest carnage of soldiers ever (not civilians) was at Cannae. 48,000 Romans lost their lives in 8 hours on that 2nd August. That is 100 per minute for 8 hours. I look forward to Fields of Blood. Happy training for the forced march along Hadrian’s wall. can you message me about yourself for qeustions by any chance? just figured that the qeustions would be answered better directly from the author. you probably get these kind of questions every day (but I will go ahead anyways, hehe), but do you know if the Hannibal series will see a dutch translation soon? Dying to read it as I ran out of Ben Kane dutchies 🙁 I’m considering buying the English series, but with these kind of books I like to just absorb all of the info in my own language. Is it worth the wait? an unlucky, impatient fan of your work! I first came across one of your books while on holiday in Italy. I was in the hotel reception and they had a bookcase of books previous tourists left behind and it was the first book in your “Forgotten legion Trilogy”, well that first book really got my taste buds going , so to speak and when I got back home I had to get the other two straight away. I wasn’t disappointed, all three had me gripped and a real struggle to put down. I really felt drawn into the story as if I was there , brilliant. I have now got to your Hannibal series and like ” The Forgotten Legion” they are a great read so gripping and compelling. I shall without doubt be moving on to Spartacus , very much looking forward to that. I have only read books on fact before as I like to relate to what has happened in reality and being Ex-Army I have for some reason have a great interest in the Vietnam war and books written on that war from both sides. I guess what I’m trying say is because of your use of faction is what makes your books interesting to me and for that thank you. Great work Ben keep it up. Déjame felicitarte por tu grandioso libro, pues me a gustado mucho, me gusta la forma en que relatas la historia y el suspenso que contiene, cada una de las escena la eh podido imaginar en mi mente. Me siento muy satisfecho con la historia. Quisiera saber si la trilogía se encutra ya traducida al español? Lo sienot por estar tan tarde! Campos de Sangre y Nubes de Guerra ya esta en espanol. Puedes preguntar en tu casa de libros, o mira a Amazon.com? Saludos. Hi Chris, and my sincere apologies for not replying for so long. I tend to use FB and Twitter mostly nowadays. It’s brilliant that you just chanced in The Forgotten Legion, and went on to read the others! I’m chuffed that you enjoy my mixture of fact and fiction too – cheers for getting in touch – Ben. Muy bueno tu libro, me ha fascinado, soy un gran fanatico de Anibal y esta obra me a sorprendido, no lo pone como protagonista pero tiene un papel fundamental en todo, me gusta ese suspenso; como habeis creado la historia de hanno y quintus , espero que los demas libros esten traducidos al español. Hola, jfetriana! Gracias por tu mensaje. Libros dos y tres ya estan traducidos en castellano – Campos de Sangre y Nubes de Guerra. Hay un obra cortido por digital tambien – La Patrulla. Espero te puedes encontrarlos. Saludos – Ben. I’m planning to buy Hannibal. But E-book or printed copy. Argh. Can’t decide. Just wondering what a writer in this modern era of Kindle and Kobo prefers. The printed page or the reading device.??? Origionaly, I got a kindle just so I could read the novellas that many authors are writing between books but are on e-book only. Presently reading Ian Ross’s War at the End of The World on it. So just curious, what is your vote. @davidsmithba: Thanks for your message. I’d go for the printed book most of the time…I love the covers, you see. I hope you enjoy it whichever you buy! Best wishes to you – Ben.